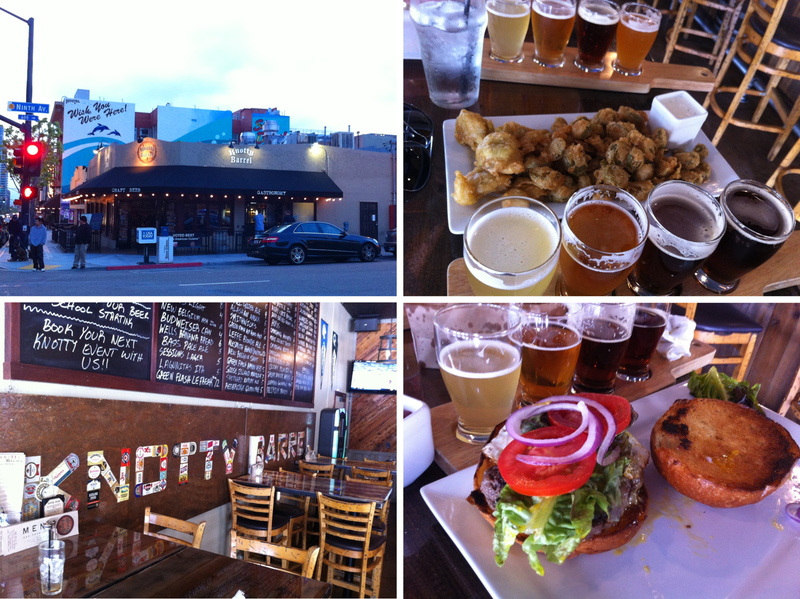 1) The outside of the Knotty Barrel, on 9th street. 2) Our appetizer, which were fried pickled jalapeños and artichoke hearts, as well as my beer sampler. We both checked in on foursquare, so the sampler was half off, making it $4 for four 4 oz glasses. 3) My lunch; the “Knotty Burger”, it came with lettuce, tomato, onion, and english cheddar, I added a fried egg for good measure. As our waitress was walking away with our order, I clarified by saying broken (regarding the egg). When I got it the egg was sunny side up, she offered to send it back and have them cook it over-hard, but I said no. I just wiped the yolk off, which saved me some cholesterol! I really only like the egg whites anyways, so it all worked out. 4) A cool sign they have in the back of the bar/restaurant. Beer bottle labels make up their name, which I thought it was noteworthy. They did also have a shuffleboard table, and with more time I would’ve loved to play, as I’ve been known to enjoy a good game of shuffleboard. 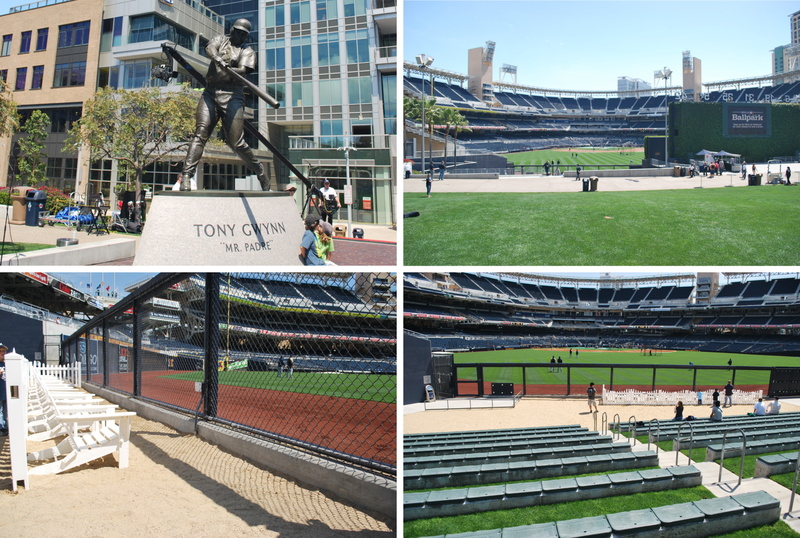 1) A statue of Mr. Padre himself, Tony Gwynn. His son, Tony Gwynn Jr., played for the Brewers from 2006 to 2008. 2) The view from the Park at the Park area (way) beyond the right centerfield fence. 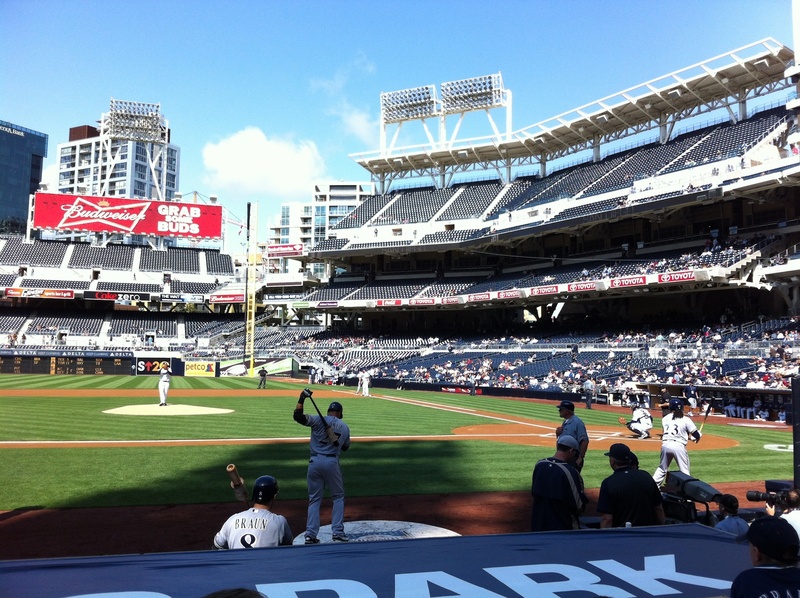 The Padres sell tickets for out there, and they cost between $5 and $8.50, depending on the game. 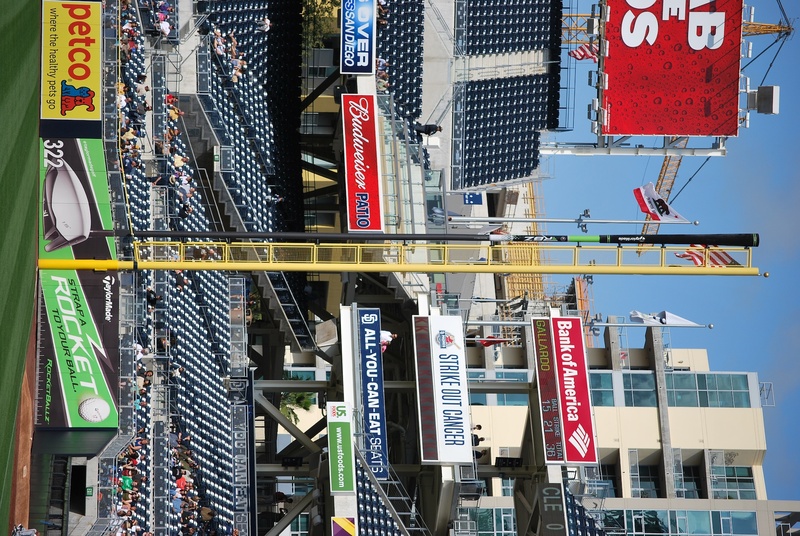 You might need your binoculars, but you’re still technically a paying a customer, they have a video board on the back of the batter’s eye, and you can see it on the right side of the picture. 3) The bleacher seats leading down to “The Beach”. 4) The front row of The Beach, these seats cost around $30, but you’re still 400 feet from home plate. With a ticket to the bleachers, which runs about $11, you can stand or sit on The Beach, but you can’t sit in the chairs I’ve shown here unless you have The Beach tickets. I talked about the Western Metal Supply Company building in my previous posts, but I took some more pictures today. I think it’s so cool that they worked the building into the design of the park. Another four parter is below, going clockwise from top left (I know that’s getting old, but for new readers I’ll keep putting it in there). 1) This has nothing to do with the Western Metal Supply Co. building, but it’s still cool. This is right inside the left field entrance, looking back up over the exterior wall of the ballpark. 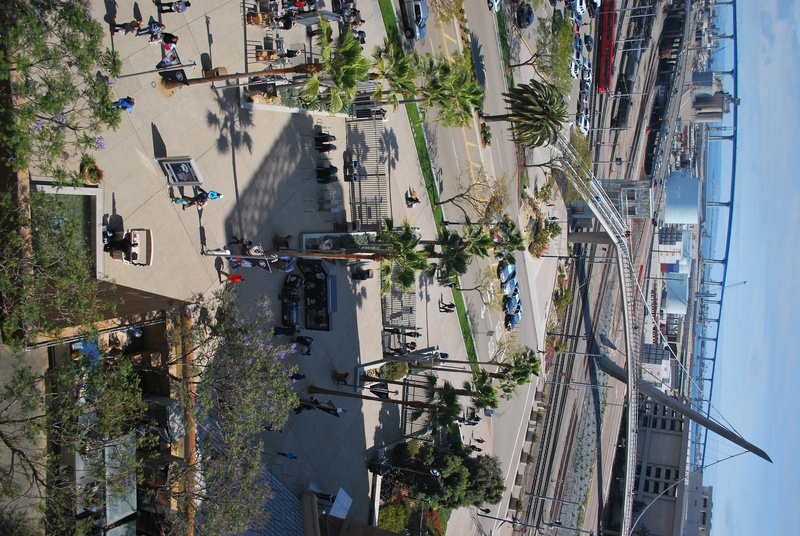 Well done, Padres, well done. 2) The Western Metal Supply Co. building in the background, with flowers in the foreground. I was out in centerfield when I took this, and those flowers are beyond the Padres bullpen. 3) The basement of the Western Metal Supply Co. building. The basement houses the Padres team store, and it’s a nice layout. When I was there in 2009 I remember being able to walk out onto the field level, as you can see the two individuals doing in the lower left. This was all part of the store back then, but now they added a field level section, and now you need a ticket to go out there. 4) We ventured to the upper deck, and I took a picture alongside the building, with the field in the background. Since you need a special ticket to get into the suites that the building houses, this was the best I could do. While in the upper deck, we got game number 25 taken care of. I think this is one of my favorites up to this point. I have to give a shout out to Victoria for taking about ten pictures until I was satisfied with the result. We still had some time to kill, so we wandered some more and I took more pictures. I went up to the very last row right behind home plate, and got a picture of the home plate entrance from above. It’s one beautiful site, you’ve got palm trees as you enter the park, the walking bridge over Harbor Drive, and the San Diego – Coronado Bridge in the background, going over San Diego Bay. I got my game number 23 picture taken on the other side of those cars that are lined up in the median. 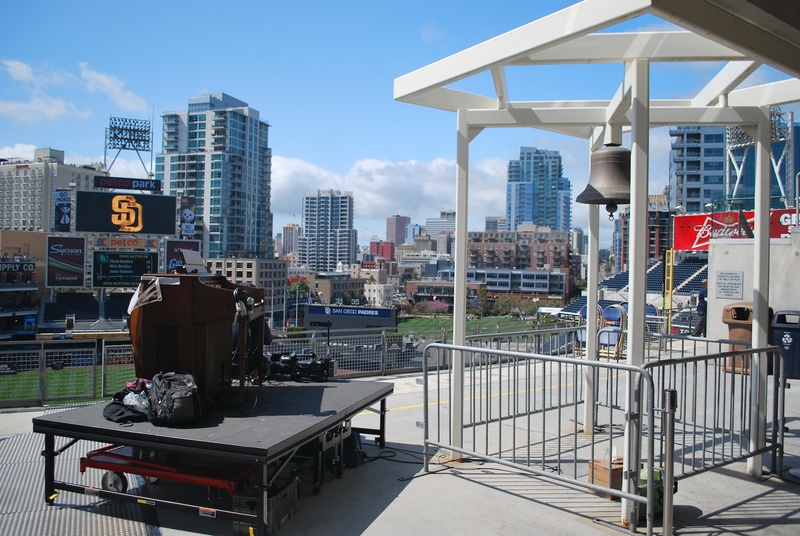 We started walking down the first base side in the upper deck, and we came across this organ. I talked to a employee nearby, and he said they use the organ for all day games, and they play it during the game from this location. The Brewers have a full time organist, Dean Rosko, and he plays for every game. I’m not sure why the Padres don’t have somebody manning it every game, but I won’t judge them for it. My artsy picture of the day has to be this next one. While I was walking towards the right field corner in the upper deck, I noticed this on some of the seats. I figured they would have them on the aisle seats up near the corner, and they did. Victoria and I made it down to our seats as the national anthem was being played (by the organist). The third row seats offered a great view of the field, and I couldn’t complain about the $76 price tag. After taking a few pictures of Gallardo while he was pitching in the first inning, I noticed that where I was taking the pictures from caused a strange vantage point. I assure you I did no photoshopping on the photo below (even though it even looks like it to me, and I took it). It appears that he needs medical attention, and fast. In the picture above you can see the head of a golf driver in the upper right, I had noticed that the day before but didn’t really think anything of it. Today I noticed the rest of it. I don’t know how I missed it during the other two games, but Victoria didn’t notice it either, so I don’t feel as stupid. I think where I was sitting the previous two games contributed to my lack of awareness. How did the game go? My answer can be summed up with four letters: B-L-A-H. Another shutout at the hands of the Padres. 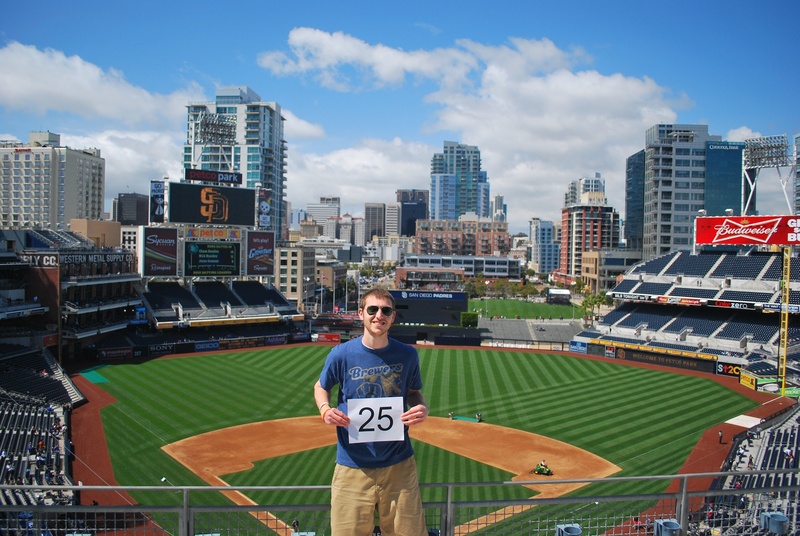 I don’t know if it’s me and PETCO park, but my record there is not good. 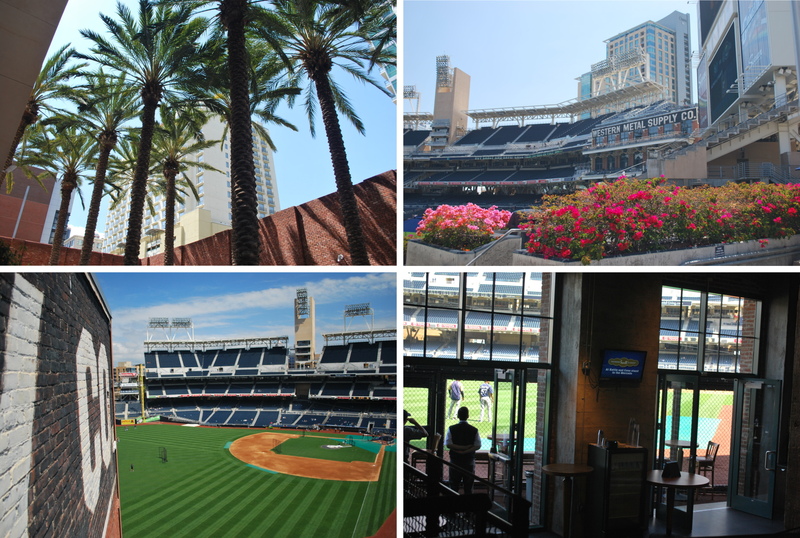 I’ve been to PETCO for seven games now, one in 2009, three in 2010, and three this year. Of the seven games, five have been shutouts. 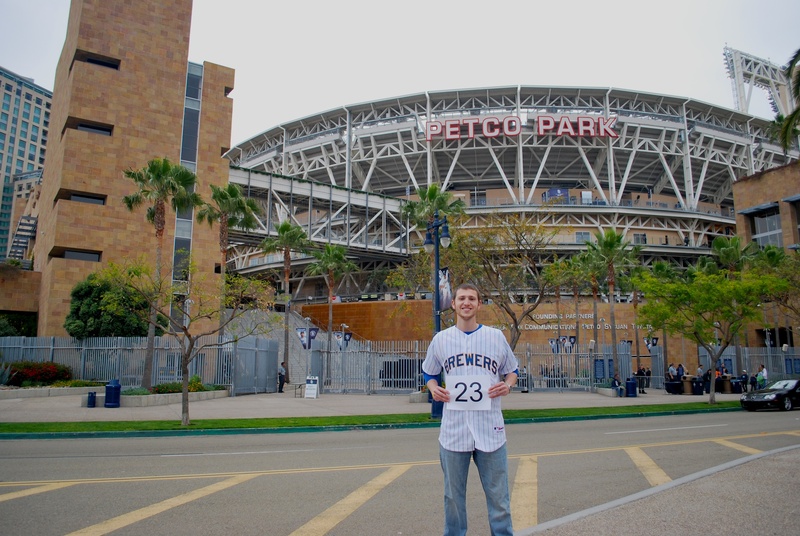 In 2010 I went to three out of the four games the Brewers played there. 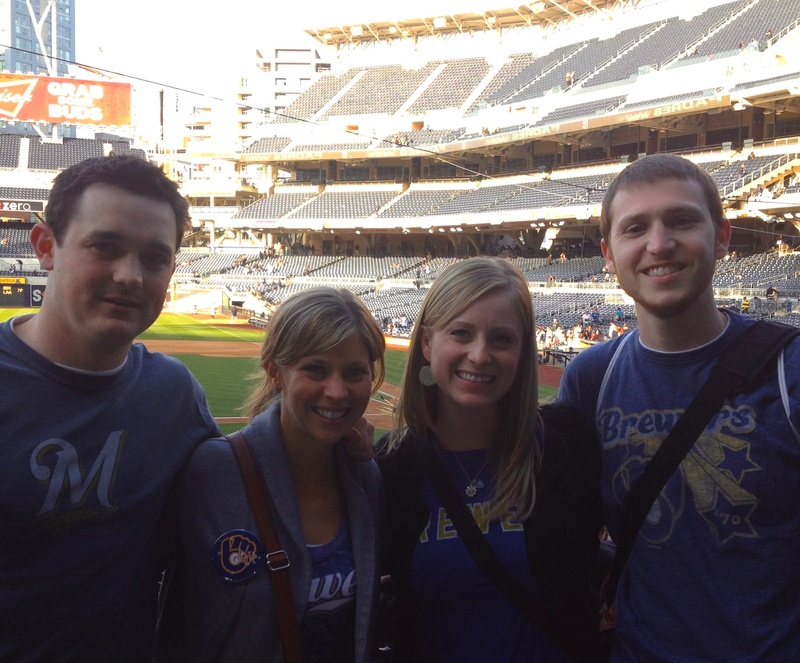 The three games I went to the Brewers didn’t score a run, the one game I didn’t go to? The Brewers won 2-1, terrible on my part. I was hoping the Brewers would have put a whooping on Jeff Suppan for “stealing” $42 million dollars from the Brewers organization from 2007 to 2010. You could rely on him to go out there every fifth day, but that was about it. He had a 5.08 earned run average as a Brewer, which was right in line with his career ERA. I wonder if he hadn’t had the great postseason in 2006, if the Brewers would have still made a run at him during the offseason. 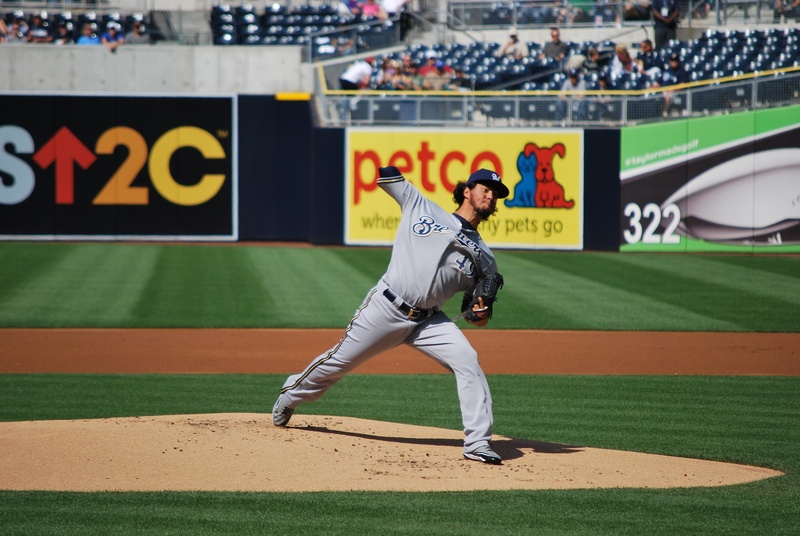 He shut the Brewers down for five innings Wednesday, allowing just four hits and two walks, while picking up the win. Final Score: Padres 5 – Brewers 0. A cousin from my mom’s side had contacted me on Sunday, and said she and her husband would be out in San Diego, and were planning on going to the Wednesday game. They had to pick up a late arriving friend from the airport on Wednesday, and made it to the game as the game was starting. In the seventh inning Annie and Chase stopped by and sat next to Victoria and I for the remainder of the game. Annie is one of my 19 cousins on my mom’s side (my mom is one of 12). Annie and Chase live in La Crosse and I hadn’t seen them since Christmas time, so it was nice to catch up. We had another fan take a picture of us after the game. From left to right it’s Chase, Annie, Victoria, and myself. 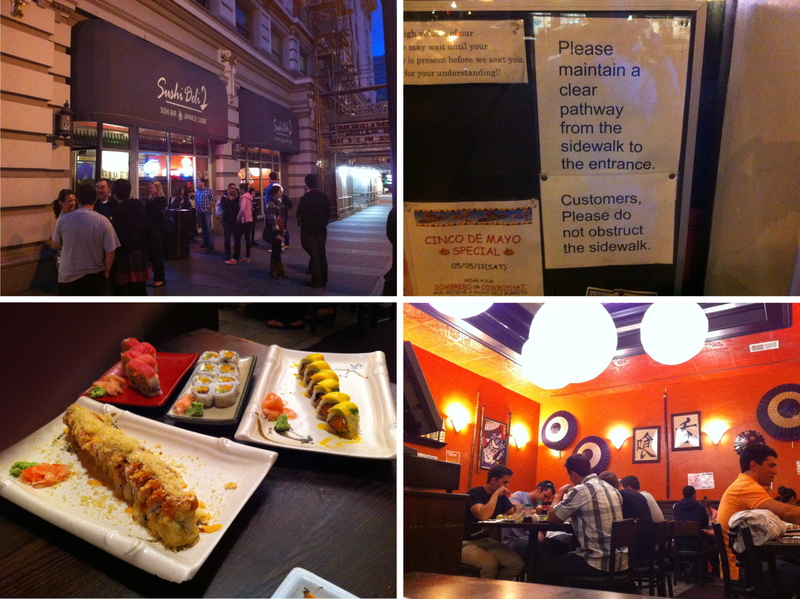 1) The outside of Sushi Deli 2, which is located on Broadway, between 1st Avenue and Broadway Circle. As you can see a gathering of people has formed. 2) The sign on the window, it’s apparent that they have people who are willing to wait for extended periods of time. It took us about 35 minutes to get seated, at 8pm, on a Wednesday. 3) The back room at the restaurant, from our table. 4) Our meal feast. On the top left is the Valentine Roll, consisting of shrimp tempura, cucumber, avocado, topped with raw tuna, and crab surimi. Top middle: Shaun Roll, consisting of sweet potato tempura, cream cheese, and avocado. Top right: Tropicana Roll, which had smoked salmon, mango, cream cheese, topped with avocado, and mango with mango sauce. The smokiness was almost too much, and at times I thought I was eating a cigarette. The bottom plate has a San Diego Roll, which contained a lobster mix and cream cheese which is battered and cooked tempura style, then topped with spicy tuna, crab surimi, “crunchies”, spicy mayo, spicy sauce, and sweet sauce. We ate everything except for the last piece of the Tropicana Roll, too much smoke for the both of us. I wish I was more excited about the baseball aspect right now, but I can’t say that. Getting shut out in back to back games on the road is no fun. Luckily I’ve got other stuff to look forward to, tomorrow it’s the beach and fish tacos at an amazing place up in Ocean Beach. Our flight leaves at 9:25 tomorrow, and gets into San Fran at 10:55. First day of I haven’t used any form of transportation this season, besides my two legs. I did use the elevator at PETCO twice, and the escalators, but no planes, trains, or automobiles.